Teacher professional learning (TPL) can function as a powerful resource in supporting culturally sustaining educational practices for multicultural and multilingual students. However, as this chapter discusses through a detailed description of the literature, the design of current TPL initiatives often leads to a perpetuation of top down discourses about the role of teachers and bilingual learners in K-12 contexts. 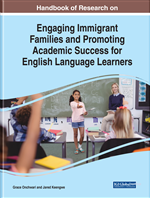 To speak to these challenges, the chapter provides readers with a detailed account of a bilingual National Science Foundation (NSF)-funded model of professional learning that could serve as an alternative culturally sustaining model for TPL. Specifically, the goal of the NSF initiative was to position in-service ESOL and science teachers of English as agentive and culturally responsive in their work. The systemic functional linguistic paradigm that undergirded the initiative placed emphasis on incorporating students' linguistic and experiential repertories in co construction of knowledge. This chapter concludes with recommendations for the field. As the U.S. school landscape continues to grow more and more diverse, the challenges teachers face often place them under the microscope as their performance in the classroom is perceived as the key component to achieving student learning. If this is the case, then teacher professional learning, usually known as professional development, becomes a crucial component for teacher change. However, for this in-service learning to be achieved, many stakeholders, both inside and outside schools, need to actively participate in the co-construction of learning experiences that are participatory, context relevant, and sustainable over time. (McComb & Eather, 2017; OECD, 2009). How can the gaps in teacher professional learning be addressed to advance the profession and improve instruction? A large and growing body of literature has investigated this topic. A recent report on teaching practices around the world (Burns & Darling-Hammond, 2014) identifies teacher professional learning (TPL) as one of the practices that can advance the quality of teaching and learning in diverse contexts, more specifically for culturally and linguistically diverse students. For decades, researchers have identified the importance of teacher knowledge as not only an issue of social justice (Darling-Hammond, 1997), but also as a crucial component to enhance student learning and success (Lee, Luykx, Buxton, & Shaver, 2007). To counter these challenges, research highlights how teacher learning needs to speak much more effectively to practitioners by creating contextual and longitudinal TPL initiatives that address the needs and sociocultural characteristics of the population it is attempting to serve. Indeed, there is copious room for further progress in determining which type of in-service professional learning for teachers optimally can serve Emergent Bilingual Leaners (EBLs) and produce sustainable change in teacher practices and beliefs. Literacies: The ability to critically express oneself through reading, writing, and other nontraditional forms of expression such as visual representations. Multilingual Teaching Practices: It encompasses those practices that comprise the use of students’ whole linguistic and cultural repertories including but not limited to language. Culturally and Linguistically Diverse Youth: In the school context, this term refers to those middle and high school-aged students whose home cultures and linguistic practices are different from those of the dominant groups. Teacher Professional Learning (TPL): The learning experiences teachers have access to and are exposed to inside and outside of their classrooms and schools. This includes non-traditional professional development activities. Emergent Bilingual Learners (EBLs): This term refers to those students who are learning the dominant language, but who, nevertheless, have already mastered their home language. The combination of the two linguistic resources implies a richer and more complete repertoire to learn. Ideological Reflection: The ability to reflect on the core set of values and beliefs that an individual in a particular society adheres to. It implies the possibility of questioning and challenging long-standing beliefs and constructs such as ethnicity, power, and social structure.